At the end of the Seven Years’ War in 1763, France ceded to Britain its claim on North American territories spanning from Quebec to New Orleans. Faced with the prospect of British expansion, a diverse group of native peoples launched a preemptive strike against forts across the trans-Appalachian west. That December, armed settlers from Paxton township murdered six unarmed Susquehannock in the Conestoga reservation, and 14 more sheltered in the Lancaster jailhouse. 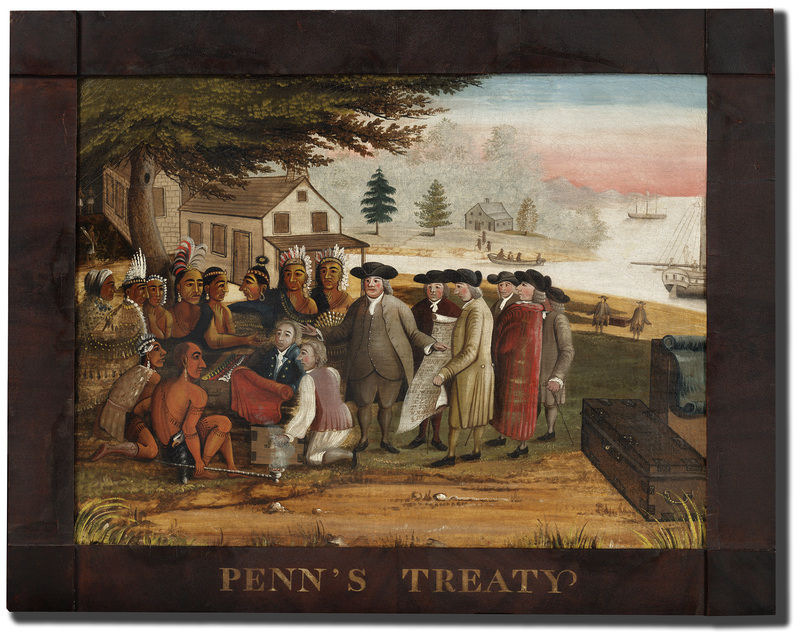 In January, they marched toward Philadelphia where the government harbored 140 Moravian Indians. 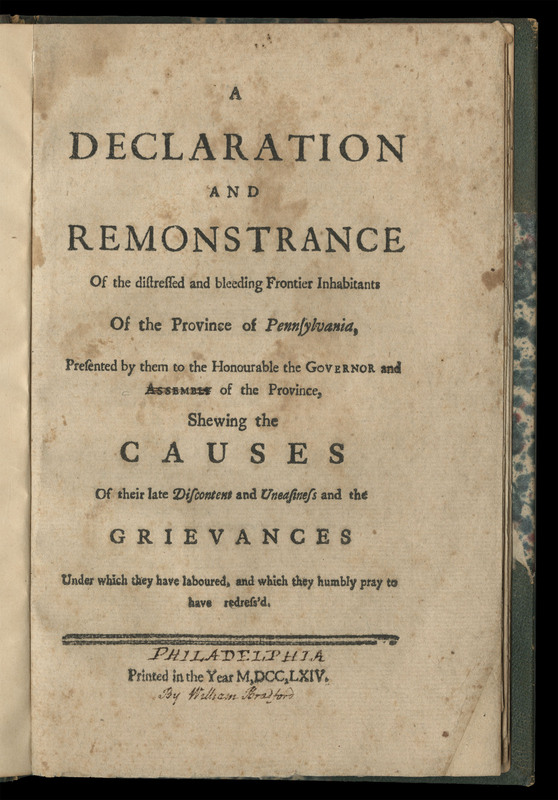 They were stopped in Germantown by a delegation led by Benjamin Franklin, who persuaded their leaders to publish their grievances in a document, Declaration and Remonstrance. 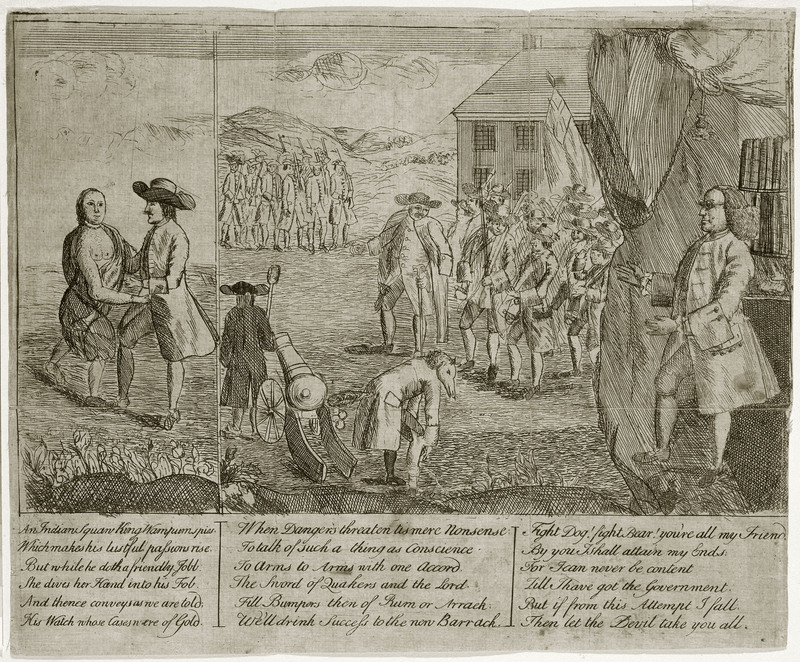 Waged in pamphlets, political cartoons, broadsides, and correspondence, the ensuing pamphlet war featured some of Pennsylvania’s preeminent statesmen, including Benjamin Franklin, governor John Penn, and Hugh Williamson, who would later sign the U.S. Constitution. But what happens to our understanding of that print debate if when we situate it in a longer story of settler colonialism? 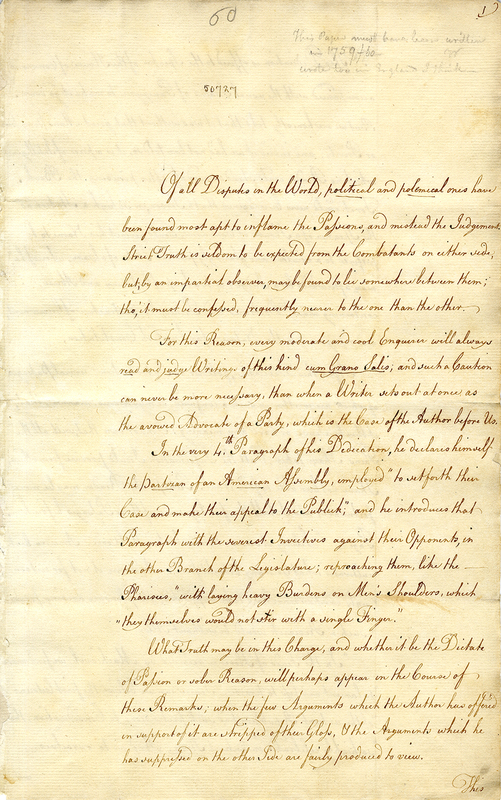 After all, the Northwest Ordinance (1787) both conceptually and practically resolves many of the grievances that the Paxton Boys’ enumerate in Declaration. 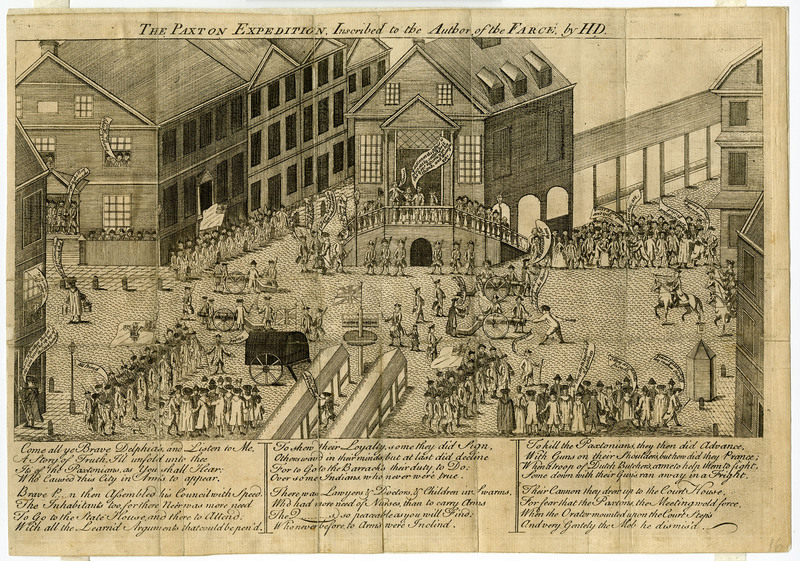 Historians have thoughtfully placed the Paxton incident in a revolutionary lineage. 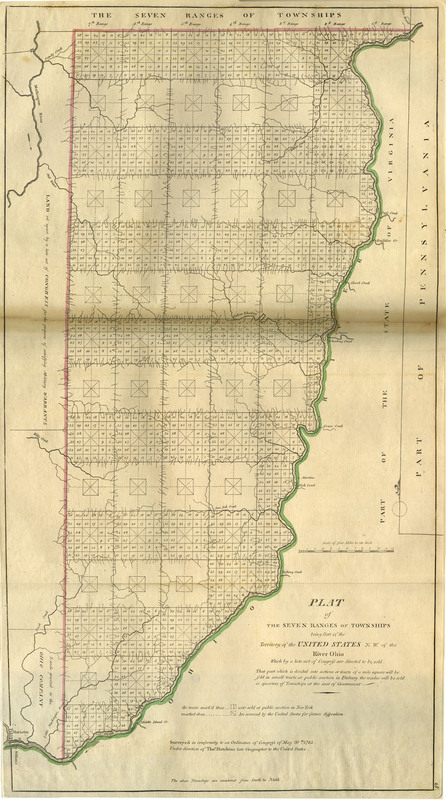 Extending that lineage to include the Northwest Ordinance allows readers to see the American Revolution as a continuation rather than a resolution of colonial debates about race and ethnicity, political representation, and settlement practices. Furthermore, de-monumentalizing the Revolution might also help us to heed Daniel Richter’s call to connect Atlantic and continental history. 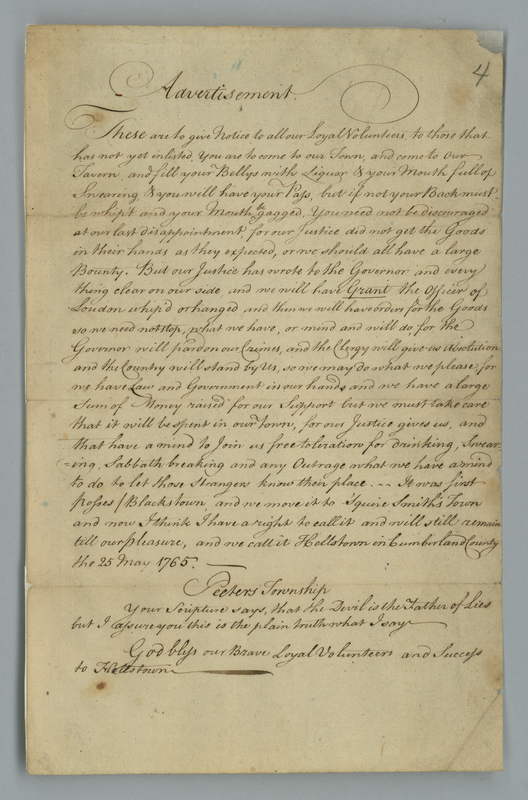 Finally, placing the 1764 pamphlet war in a timeline that extends from the Seven Years’ War to the Northwest Ordinance opens up the Paxton crisis to those who might not otherwise know about it. If the backcountry is often treated as a massive negation in early American history, as Ed White warns, the Paxton expedition forces us to confront that absence—backcountry settlers literally march to Germantown. By reading an ostensibly urban debate about Paxton conduct alongside correspondence, journal entries, and diaries available at regional archives, scholars and educators can de-emphasize urban polity and introduce students to archival research. 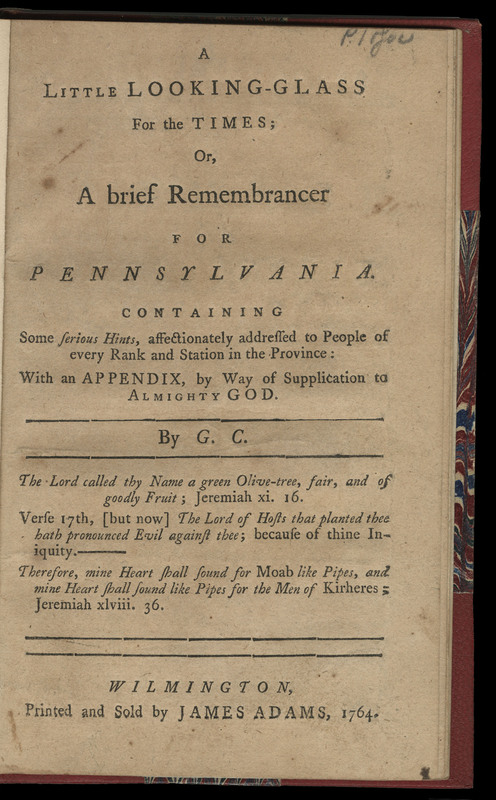 As students and scholars look beyond the pamphlets that once defined study of pamphlet war, this project's Digital Collection is intended to support new attention to visual and manuscript materials. Follow the path below Contents to explore this new looking-glass for the 1764 Paxton pamphlet war. 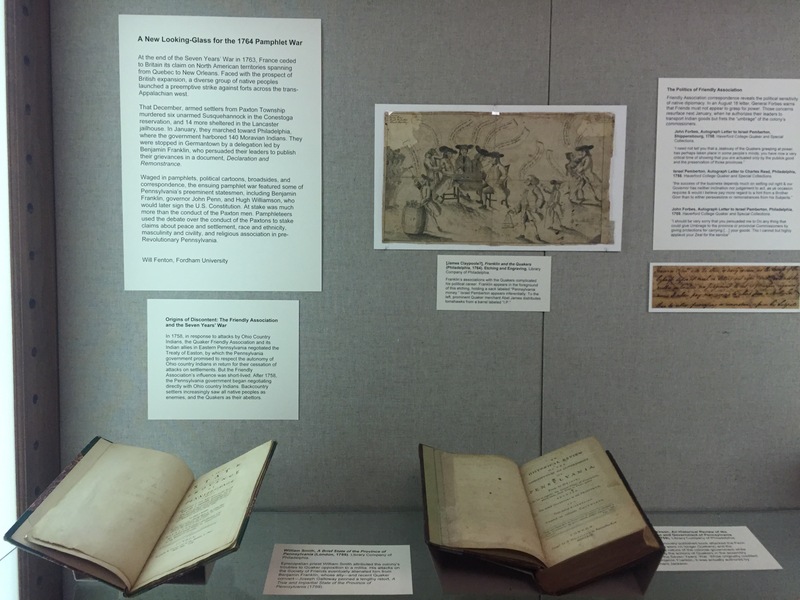 This pathway began as a material exhibition curated by Will Fenton at the Library Company of Philadelphia in Spring 2017, and it would not be possible without the resources, support, and generosity of staff at the Library Company of Philadelphia, Historical Society of Pennsylvania, American Philosophical Society, and Haverford College Quaker and Special Collections. Special thanks are due to Michael Goode (Assistant Professor of History, Utah Valley University), who helped shape this exhibition, and James N. Green (Librarian, Library Company of Philadelphia), who made it all possible.